BRUTAL, JUST BRUTAL: Markets Look Horrible! The market is not taking any prisoners, breaking down and dropping below many of its long-term moving averages, which is an obvious bearish signal. The U.S. dollar is, of course, enjoying some technical demand; when people sell stocks, they receive USDs instead, so the mighty buck is trading at 52-week highs. This is classic, late-cycle drama. Just like in the late 1990s, when we saw unbelievably crazy crashes during the last four years of the bull market, these violent moves down only solidify that we are gearing-up from a massive rally, shortly. Look at the S&P 500 index during the 1996 to 200 era, in which it was less volatile than the NASDAQ index, and realize that in the last four years of the bull market, it endured tremendous gut-checking moments, before it went ballistic. There is so much to be bearish about at any given time, especially with bombs being sent to top officials’ houses, mid-term elections approaching, and inflation ticking-up, as President Trump and the Federal Reserve’s chairman clash on policy and strategy. But, underneath it all, the S&P 500 has dropped an abnormal amount of consecutive days, making some companies attractive again. Wealth Research Group is incredibly bullish right now, but we are letting this sell-off wear out, before we invest again. This is how the stock market behaves in the latest part of the bull market. An unusually large amount of companies enter the bear market, before the broad indices actually peak. 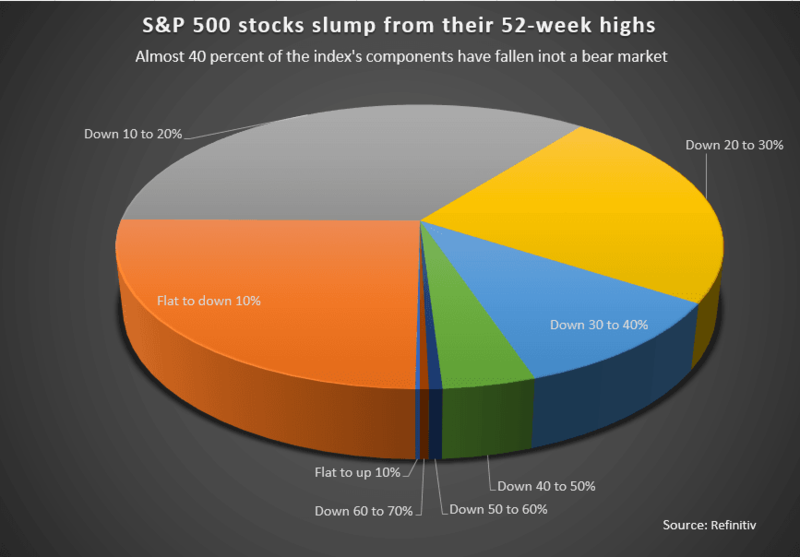 In other words, a small number of stocks carry the entire index higher, above and beyond the negative impact of the rest of the component companies. The important lesson to learn here is that timing trades so late in the game is next to impossible, so you must either cash out, hoard, and save, patiently waiting to see how this ends before returning to the markets, or stay LONG, come what may. The U.S. stock market has gone up, historically, over 75% of the time, on 3 out of every 4 trading days. No doubt, these are some of the scariest days for one’s portfolio, but here are some simple tools to make sure that you can handle the down days, as effectively as you do the green days. First of all, store, in cash, outside the stock market, at least one year of living expenses, tucked away, untouched. I would do this well before ever investing a dime. Take it further, still. I converted 24 months of living expenses into precious metals. At any given time, I can take delivery on these coins or sell them back to the dealer and capitalize my bank account. Thirdly, if you want even more liquidity options, my life insurance policy, which is called “Whole Life,” allows me to withdraw the cash value of the policy and remain covered, nonetheless. Put differently, I have a 6-figure cash position, which I can tap into at any time, and it won’t impact my coverage. Don’t get intimated by sell-offs, then; get disciplined. Become fortified and learn to bite your lip. Better yet, if there are companies you want to own, these are the best days to take action.